Kelsey Saboraki (MSc student) is investigating behavioural transmission of Chronic Wasting Disease in mule deer and white-tailed deer. Kelsey got her start in the Lingle Lab by volunteering with the annual ground squirrel census at the McIntyre Ranch in May 2013. 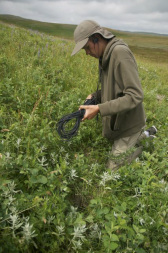 She returned that and subsequent summers to the McIntyre Ranch to conduct playback experiments with mule deer. During her undergrad, she did her Honours thesis on population genetics of bearded seals with Dr. Stephen Petersen from the Assiniboine Park Zoo. Kelsey returned to studying terrestrial mammals (deer) for her MSc project with the support of a Biodiversity Grant from the Alberta Conservation Association. Hi folks, my name is Anthony Leong (MSc student). I’m from Redondo Beach, California and I obtained my BA in Psychology from Reed College in beautiful Portland, Oregon. I completed a thesis project in my final year. My current thesis project here at UW looks at how human mothers and women respond to infant cries. My supervisor, Dr. Susan Lingle, found in her research that deer mothers show characteristic maternal responses to infant cries of other species, including humans. The study I’m working on will measure physiological and emotional responses of human participants to human and non-human cries. We hope to learn about the evolutionary relationship, and possible continuity, between humans and other mammals. In 2018 I received a travel grant to attend and present my research at the Prairie University Biology Symposium in Calgary. I enjoyed the conference and loved visiting Calgary. To prospective students: the University of Winnipeg Grad Studies department is a wonderfully small, tight-knit community. I have been fortunate to make some great friends here, people who are all uniquely committed to their research and science at large. If that sounds like your kind of community, check out the Bioscience program. 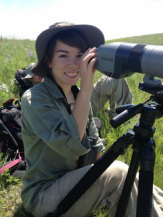 Cora Romanow (MSc student) is investigating female mating tactics of mule deer and white-tailed deer. Cora has been involved in research in the lab since 2011 when she volunteered to help with playback experiments with mule deer and white-tailed deer at the end of the summer field season. She returned the next spring to volunteer for the annual ground squirrel census in May, and stayed on with a field team to continue conducting playback experiments for the summer. In subsequent summers Cora went on to supervise the playback team. She has trained a number of other students to conduct field work and has assisted with data collection for Kelsey’s MSc research on behavioural transmission of CWD and Rebecca’s Honours research on fawn play. Outside of the field, Cora has helped extensively with acoustics analyses for student projects and publications that have come out of our lab. For her undergraduate Honours thesis research (2013-2014), Cora recorded and analysed vocalizations made by newborn, older calf, adult female, and adult male elk. Rebecca Carter (MSc Student) has worked in the lab since 2016, first as a volunteer for the annual Richardson ground squirrel census in May. She continued as a member of the playback team during the summer of 2016. For her undergraduate Honours thesis research (2016-2017), Rebecca examined the play behaviour of mule deer and white-tailed deer fawns in relation to their antipredator behaviour. With Cora’s assistance, Rebecca collected behavioural observations and video recordings of play bouts during the summer of 2017, which were used to complete a detailed form analysis on the play of each species. Currently, Rebecca is examining potential ecological and behavioural mechanisms that facilitate or prevent hybridization between mule deer and white-tailed deer. Jason Airst (MSc student). Jason did his B.Sc. at Dalhousie University and worked on a variety of field biology jobs over the last few years, including with the Canadian Wildlife Service, the Alberta Biodiversity Monitoring Institute, the Thai Society for the Conservation of Wild Animals, and the well-known Kalahari Meerkat Research Project. For his MSc research, he examined the effect of species and size in male mating tactics in mule deer and white-tailed deer. 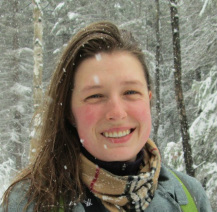 Maegwin Bonar (BSc Honours 2013) attained advanced training in Geographic Information Software (GIS) as she investigated the habitat and social traits that influence predation on white-tailed deer and mule deer fawns for her Honours thesis. After doing a MSc on caribou at Memorial University of Newfoundland, she received a Vanier scholarhship to conduct her PhD on migration of ungulates at Trent University. Agnès Pelletier is interested in behavioural ecology, wildlife ecology and wildlife genetics. Following her PhD at Trent University, she came to Winnipeg and initiated work linking behaviour to Chronic Wasting Disease in our lab. She is active with The Wildlife Society and participated in their leadership institute. 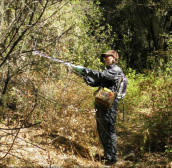 Agnès is now working as a wildlife biologist with the B.C. government. Travis Bannatyne volunteered for the annual Richardson's ground squirrel census (2013) at the McIntyre Ranch, took the Prairie Field Course and then returned to the McIntyre Ranch to conduct playback experiments with mule deer. For his Honours thesis (2013-14), Travis used our long-term winter census data to examine how habitat use and habitat segregation of mule deer and white-tailed deer vary with large changes in the density of each population. Keir sets up for a playback trial. Keir Naylor (BSc Honours 2012) compared the behaviour of mothers and newborn white-tailed deer and mule deer for his Honours thesis. One very cool result, which he presented at the Animal Behaviour Society meeting in Albuquerque in 2012, was the discovery that white-tailed deer mothers deposited their fawns in mule deer groups, apparently using the mule deer mothers as babysitters! Keir returned to pursue a degree in education and is now teaching science at a high school in England. Finbarr (Finn) Wilson is a long-term volunteer who has worked on the project at the McIntyre Ranch since its inception in 1993. He has worked full-time for portions of some years and volunteered in other years. He has been involved in capturing and marking fawns, radio-tracking fawns and coyotes, observations of coyotes hunting deer and in playback experiments. He does the annual post-summer/pre-winter and the post-winter deer censuses, which enable us to track annual variation in fawn survival. Finn is always keen to share his thoughts on philosophy and evolutionary biology over a few glasses of wine. In his real life in Calgary, Finn is a writer, but still shows his fondness for evolutionary biology, having started a company called Red Queen Creative. Mary Timonin (Postdoctoral Researcher 2013-2014) conducted research on different aspects of rodent scent and acoustic communication and paternal care when doing her PhD at Queen's, working as an NSERC Postdoctoral Fellow at Cornell and the University of Liverpool, and more recently at the University of North Carolina. Mary came to our lab to work on a new study in our lab, in which she measured emotional and physiological responses of humans to infant cries from a range of species. She left the lab in August 2014 to enter the veterinary program at the University of Saskatchewan. She is now working at a veterinarian at Memorial Universiity of Newfoundland. Lisa Teichroeb (BSc Honours 2012; at left and below at right) compared distress vocalizations of six species of ungulates for her Honours thesis in the lab. She found that the calls of the different species are very similar apart from differences in the fundamental frequency (pitch). 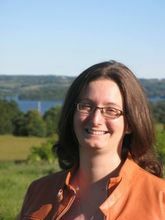 She pursued a MSc at University of Saskatchewan, and is now working with The Nature Conservancy of Canada in Winnipeg. Kyle Antonchuk (BSc 2010) was involved in playback experiments with black-tailed deer and California mule deer on the west coast, and with pronghorn in Alberta. He also did an Honours thesis in the lab, using maps of coyote packs hunting deer fawns to test whether coyotes maintained constant encounter rates when hunting deer fawns despite variation in the density of fawns. 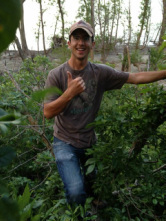 Kyle is now gainfully employed as a Fisheries Biologist with Manitoba Conservation and Water Stewardship. Maha Ghazal (BSc Honours, 2013, at left, with Kyle and Lisa) obtained her first experience in field research and biology in summer 2010, when we worked with black-tailed deer on the California coast. Maha then worked with Manitoba Conservation in summer 2011 and part-time while a student and then did an Honours thesis investigating polar bear den sites (with Dr. S. Peterson, Assiniboine Park Zoo). Maha has been living in Arctic village Pangnirtung on Baffin Island for several years where she works as a Marine Mammal Advisor, while also pursuring a MSc at the University of Manitoba. Natashya Wall (BSc Honours 2013) obtained her first experience in field research and biology by taking the field course and then working on the deer project at the McIntyre Ranch in 2011. She decided ecological work was right for her. She completed her Honours thesis on paternal care in black birds with Dr. Scott Forbes. She did a MSc in Biology at McMaster University. C-Jae Morden Breiter worked as a GIS technician in the lab, enabling her to upgrade her GIS and statistical skills following her M.Sc. at Concordia University during which she worked with reindeer in Finland. She did an analysis of coyote feeding habits on alternative prey species at Grasslands National Park and and presented a poster on this topic at the Canadian Society of Ecology and Evolution and The Wildlife Society Canadian Chapter annual meetings. C-Jae is employed as a reserachers in the Conservation and Research Department of the Assiniboine Park Zoo. Shawn Old Shoes (at right with Cora and Maegwin) is a student in New Media at the University of Lethbridge. 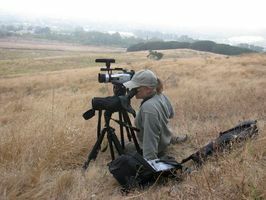 We were thrilled to have his expertise with video when conducting playbacks with deer. Tracking rapidly moving deer with a video camera from a long distance is not an easy task! 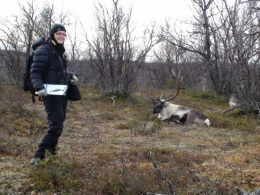 Saskia Hildebrandt (BSc, Biochemistry) obtained her first experience in field research and biology by taking the field course and then by working on the deer project in summer of 2009. Saskia focused on the analysis of coyote feeding habits at Grasslands National Park and was co-author of a conference presentation on this topic. She received the Governor General's Silver Medal for having the highest standing in an undergraduate degree and the Chancellor's Gold Medal for the highest standing in science. Melanie Pachkowski (left) obtained her first experience in ecological research when she volunteered and then hired to work on the project at the McIntyre Ranch. Melanie proved she was not only enthusiastic but persevering when she returned to conduct winter censuses of the deer in the legendary southern Alberta wind. This research experience enabled her to obtain a competitive M.Sc. placement, with caribou at the Universite de Sherbrooke. Last heard, she was heading to Australia to work with kangaroos. Melyssa Vachon (right) was an exchange student from Quebec working with the local Fish and Wildlife office in Lethbridge when she volunteered to catch fawns for our work on fawn survival. She returned to the Alberta study site to work full-time the following summer.